Spy Blog and others, try to be vigilant about UK Government, schemes involving technological systems and infrastructures which, if not operated honestly, transparently and under strict control, could easily be abused to betray our freedoms and liberties, either now or in the future. Information leaflets and posters have been sent to every police force in the UK advising the public on how to identify and report offensive or illegal content. "Information leaflets and posters", to promote a world wide web based campaign - surely this is not the correct media communications strategy ? How many leaflets and posters have been distributed ? Have the spelling mistakes in this Press release web page also found their way into the printed material ? How much public money has this cost ? It promotes an online tool - which can be found on the Directgov website (new window) - that allows people to report material anonymously. Security minister, Baroness Neville-Jones, said that it's vital that online extremisim is taken seriously: 'I want to encourage those who come across extremist websites as part of their work to challenge it and report it through the DirectGov webpage. "extremisim" [sic] should presumably be spelled "extremism"
Why not use the existing MI5 Security Service or the Metropolitan Police secure online web forms then ? 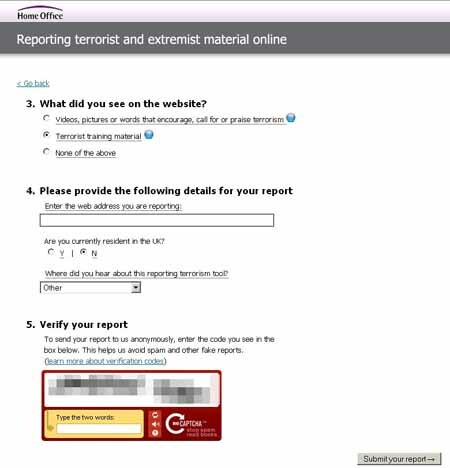 Websites reported to Directgov via its online form are referred to the national Counter Terrorism Internet Referral Unit. The specialist team of police experts work with industry and partners in the UK and abroad to investigate and take down illegal or offensive material if neccessary. "neccessary." [sic] Does the Home Office Press Office really have no access to spell checkers ? Surely all Civil Servants should be able to spell "necessary", something which some of them, clearly, are not ? Presumably "national" should also start with a capital letter. Who is the person in charge ? Who exactly are these "partners in the UK and abroad" ? How can they be contacted by the public, apart from via this allegedly "anonymous" web form ? How is their effectiveness and value for money assessed and by whom ? What are the mechanisms for detecting and correcting the mistakes and "collateral damage" that they will inevitably make ? How is this website reporting and takedown mechanism compatible with the stated European Union policies on the topic, which stress that they must not damage the fundamental human rights of freedom of speech and association etc. ? 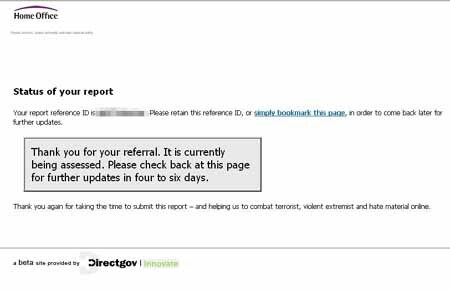 In the last year, reporting through Directgov has helped the government remove content which has included beheading videos, terrorist training manuals and calls for racial or religious violence. To report content visit the Directgov website (new window) . Have any of these "successes" actually involved websites physically hosted in the United Kingdom ? Have any of them involved invoking the "takedown notice" legal powers under the controversial Terrorism Act 2006 sections 1 to 4, Encouragement etc. of terrorism ? Is this web form really "anonymous" ? Has the Marsham Street kremlin learned anything about running an anonymous whistleblower website submission form, from the likes of WikiLeaks.org and its couple of other emulators ? This website is intended for the public to report any illegal terrorist or violent extremist information, pictures or videos found online. The report only takes a few minutes to complete, and all reports received are anonymous and reviewed by specialist police officers. Is the web form "secure" ? Probably, but it is not configured as professionally as it should be. Incredibly, for a system which involves national security intelligence gathering reports, the SSL / TLS encryption is misconfigured on the reporting.direct.gov webserver. It is unprofessional to configure any public web server with a Digital Certificate, without disabling the weak 40 bit and 56 bit cipher options, which can easily be broken in real time by today's personal computers. There is no excuse for not disabling the deprecated SSL 2.0 protocol either. The other two web forms which solicit national security or crime related information e.g. Most modern web browsers will usually connect with this web server using strong encryption (at least 128bit encryption). However the deprecated SSL 2.0 protocol could be used in combination with a man-in-the-middle attack (e.g. invoking a rogue wireless access point) to force the use of weak 40bit or 56bit encryption, which can be easily broken in real time , on today's computer hardware. Why is there only space for a URL ? What exactly do they hope to gather which Google has not already indexed ? Even if you believe that it is a good idea to simply collect suspicious web URLs, it should be obvious from previous convictions, let alone ongoing investigations, that most criminal content available via the world wide web will be on password protected private web forums etc.. There is nowhere on this Report form to supply a username and password to such private areas, something which prevents Google or other search engines from already having accessed and indexed these. There is no way of adding any comments or context or background information. Using Google Re-Captcha for this form is wrong ! It is reasonable to use a Captcha system, running from the UK based Direct.gov.uk servers, to reduce the amount of script driven spam which this web form will attract. Instead, the web form uses the Google operated Re-Captcha running from servers in the USA. This is totally wrong for a United Kingdom based terrorism intelligence gathering system from the perspective of public trust and the promises made about "anonymity" ! Why should Google, a foreign based company (and therefore the US government) be handed over the internet address and web browser details of every supposedly "anonymous" terrorism information related report ? Every time the Reporting form is loaded, the Google Re-Captcha web and application servers will log your IP Address and web browser details as the graphical images are pulled across from the USA. Google will also have log file details every time the Re-Captcha codes are filled in and submitted i.e. they will be easily able to tell which visitors to the web form have actually submitted something. Make sure that you are not logged in to any Google products e.g. gmail or , on your Android smart phone, Google Latitude etc. 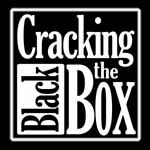 Use Tor or other methods of hiding your traceable IP address. otherwise you will risk your "anonymity", which could have serious consequences for you, either from the terrorists or extremists you are reporting on, or from the bureaucratic police and intelligence agencies you are reporting to. How is this intelligence data being transmitted from the web server to the CTIRU ? 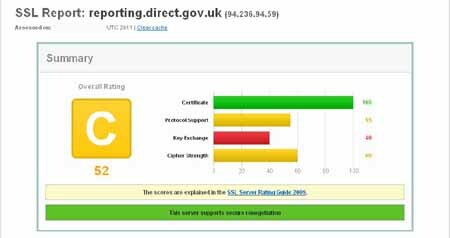 Can we be sure that the "report form" data is not being kept unencrypted on the reporting.direct.gov.uk webserver ? Is it being emailed in a plaintext, unencrypted format ? Is it available for download through unencrypted protocols like FTP ? There is no public promise that proper encryption techniques are being used, so we must assume that they are not. Are there any good points about this form at all ? A major failing of the MI5 Security Service SSL encrypted national security / terrorism "reporting suspected threats" form, is that there is never any acknowledgement that the information you supply has actually been received, let alone read, let alone acted upon.The form is a one way, information "black hole", which discourages everyone from ever using it more than once. This reporting.direct.gov.uk web form does at least have a supposedly random reference ID code which can be used to bookmark the web page for you to come back later, and perhaps get some idea of any further action that the Counter Terrorism Internet Referral Unit may have got around to. for further updates in four to six days. It is too early to tell if they will actually give people who have reported a URL, any meaningful feedback, but there is always hope. This supposedly secure and "anonymous" terrorist related reporting system has been allowed to go live to the public, without these basic security and anonymity flaws being noticed and corrected. Home Office politicians and senior officials, Police and Intelligence Agency officials etc. appear to have learned nothing from their past failures under the Labour government. 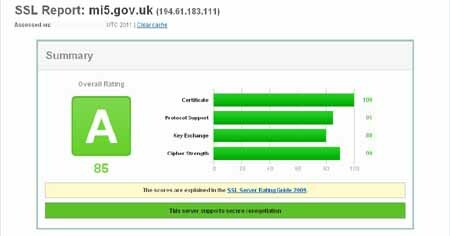 Why were the GCHQ / CESG ("The National Technical Authority for Information Assurance") people not involved in checking this web form and web server, before it was allowed to go public ? The Senior Responsible Owner of this government project, should take public responsibility for its failings. Is there actually one person in charge, or is decision making evaded somewhere between ACPO, the Metropolitan Police and the Home Office ? This also reflects badly on the level of internet expertise within the Counter Terrorism Internet Referral Unit. If they cannot instantly recognise weaknesses in their own web form, what use will they be against anything but the simplest of terrorist or extremist websites ? Our fear is, that through ignorance, they will then cause "collateral damage" to innocent websites or IP addresses, through over-broad Terrorism Act 2006 section 3 "takedown orders" , or through the physical seizure of computer hardware which hosts innocent people's websites or through the legal intimidation of domain name registrars. The Home Office press office should get a spell checker for their web page press releases. seems to have been fixed i.e no more deprecated SSL 2.0 protocol and no more weak cipher suites. This Digital Certificate expired nearly a year also and also seems to suffer from SSL 2.0 and weak cipher suites etc. in the workflow of the the web form for them to type their Response Code into, assuming that they have written it down or remembered it. Saving the web page or bookmarking it does poses potential anonymity betrayal risks to anybody who is trying to report their concerns about a web page or website from within an organisation or company etc. - it could tip off their colleagues who might be up to something illegal. The Home Office also does now appear to have corrected the spelling mistakes on their web page press release.